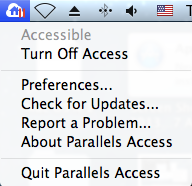 Parallels Access connects to a remote computer using a secure encrypted connection. To establish connection you need to login to your Parallels Account from both the Parallels Access app on an iPad and Parallels Access Agent on your computer. 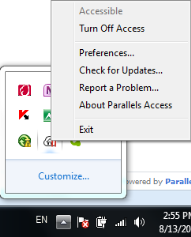 If you would like to provide additional level of security when connecting to your computer, you may set up the Parallels Access Agent to require entering your computer user name and password. Click on Preferences -> Advanced -> select "Ask for my Mac OS X user name and password as well" (for a Mac) or "Ask for my Windows user name and password as well" (for a PC) radio button.